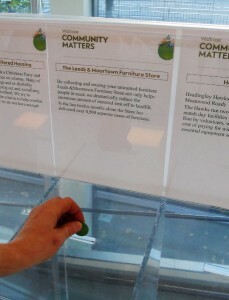 Throughout November the Meanwood branch of Waitrose has once again chosen the Leeds and Moortown Furniture Store to be one of the beneficiaries in its Community Matters scheme. That means that at the end of the month L&MFS together with two other local organisations will share in a total award 0f £1,000: the final sum each receive depends on how many green counters customers place in the supermarkets special collection tubs. This entry was posted in Fundraising, News File, Partnerships, Raising awareness and tagged Community, Donations, Hope, Support. Bookmark the permalink.